Three-Day Course: Monday, Wednesday, and Friday. The next session begins March 18, 20, 21st, 9:30 am to 12:30 pm each day – 9 hours total instruction. Class size limited to 12 students – you are encouraged to register now as this class is one of our most popular and books up quickly. 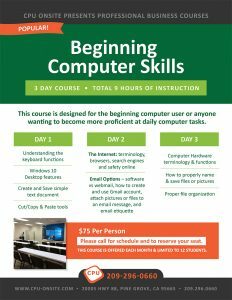 This course is designed for the beginning computer user or anyone wanting to become more proficient at daily computer tasks. A final test will be administered upon completion to measure the new skills learned. A Certificate of Completion is presented to all students who pass the final test with a score of 80% or higher.